Peace is Costly, But is it Worth the Expense? Gambians all over the world are spending Christmas like every other person. But unlike others, the champagnes are on ice. The festivities are on hold and even the Christmas turkeys are marinated with ingredients of uncertainty and trepidation. This is especially so for our Christian brothers and sisters who, had it not been for therecalcitrance of their now erstwhile president Yahya Jammeh, this would have been a Christmas to remember. Despite attempts by regional heads of states to reason with Jammeh, he remains strong headed in his desire to cling on to power. This is borne out of HUBRIS. We are all victims of our own hubris at times. Some may see Jammeh’s stubbornness as a dream of innocence; and this depends on a denial of reality that can be his own form of hubris. Jammeh is in denial of the reality that Gambians are witnessing today. He professes to be a man of Allah; but even great men bow before the sun which melts hubris into humility. The problem with Jammeh is not a lack of competence. It is confidence without competence. He thinks that the way he understands God is the way God is. That is exactly what will mark his down fall. Dictatorship naturally arises out of democracy, and the most aggravated form of tyranny and slavery out of the most extreme liberty. Jammeh has been both ruthless and eccentric; especially when he claimed to have the powers to cure Aids and infertility in women. When he was reminded about the fate of Libya’s Muammar Gaddafi, he once remarked in an interview in 2011 with the BBC’s Focus on Africa radio programme, “My fate is in the hands of almighty Allah,” “I will deliver to the Gambian people and if I have to rule this country for one billion years, I will, if Allah says so. His regime was punctuated with an “absolute intolerance of any form of criticism” in The Gambia, with death threats, surveillance and arbitrary night-time arrests of journalists “who do not sing the government’s praises”. Since his rejection of the elections results, Jammeh has conveniently whisked his first family to the United States. When Jammeh took power, he was a 29-year-old lieutenant, fresh off four months of military-police training at Fort McClellan, Alabama. On his ascension to power, the popular belief among Gambians was that, this fresh faced lieutenant will usher in a revolution for a better life for his people. But Jammeh has proved that “one does not establish a dictatorship in order to safeguard a revolution; one makes the revolution in order to establish a dictatorship”. 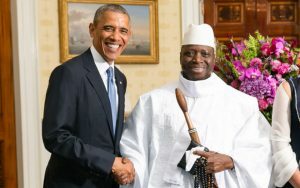 Like many dictators, Jammeh has a soft spot for America and the west. Real-estate records show that a trust linked to Jammeh owns a $3.5 million mansion in Potomac, Maryland, which was purchased from a retired NBA player. Jammeh’s Moroccan wife Zineb’s favorite destination is USA, where she shops at malls near Washington, D.C., for clothes, shoes, and jewelry. For household provisions, she prefers Sam’s Club. Jammeh’s teenaged daughter, meanwhile, attends an expensive boarding school in Manhattan; where her mother occasionally visits. What this tells us is that, underneath the veneer of his anti-western pan Africanism, Jammeh truly aspires to an upper-class American lifestyle. As ironies go, Jammeh has always portrayed an image of Pan-Africanism that is cloaked in anti-western rhetoric. 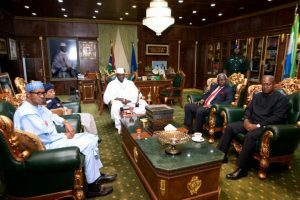 In a diplomatic cable released by WikiLeaks, Jammeh insinuated that the United States had supported a failed coup attempt against him. 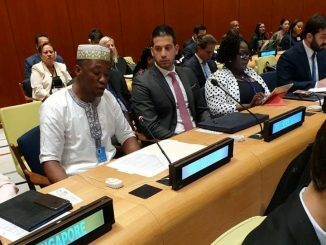 Jammeh was furious that his country was suspended from the Millennium Challenge Corporation, a U.S. foreign-aid program, on account of its human-rights record in 2006. He withdrew his country’s membership from the Commonwealth. America is known to take a hardline against foreign dictators. Presidents like Mugabe, Assad et al have at one point in time been recipients of travel bans to USA. But some countries like China, with poor human rights record have remained protected species; considering the bilateral relationships at stake. But Gambia has an annual GDP of about $1 billion, and is of no strategic importance to the U.S. It’s hard to imagine what the U.S. government gets from allowing Jammeh’s family to seek sanctuary in Maryland, aside from a bit of state sales-tax revenue. This is especially so, when you consider that Jammeh appears ready to tear the rule book on democracy and potentially throw this little peaceful country into chaos. By giving “refuge” to Jammeh’s family in these trying times, many would see America’s stance as complicity at best. The paradoxical irony is that, a man who plans to trample on the very foundations of democracy is seeking comfort in the arms of one of the world’s greatest disciples of democracy. If America wants to maintain its position as the High priest of Democracy, then it should to all intents and purposes, deny this family a hide out. America cannot preach democracy on the one hand, and provide sanctuary for dictators when the going gets tough. 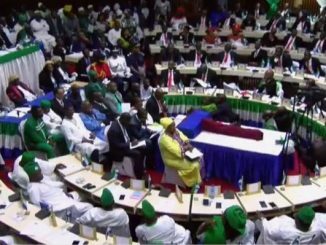 America may not appear to support Jammeh in his current stance. But allowing Jammeh to protect his family on US soil for safe keeping can be interpreted by many as neglect of the African Dream for Democracy. So how do you solve a problem called Jammeh? History shows that large-scale sanctions have little effect. While some believe that seizing the Maryland mansion and barring Jammeh and his wife from traveling to the United States would no doubt hurt, others think that such measures would make things worse; but that prolonged dealings with Jammeh can actually help to liberalize his mind. With a country that stands for free thought and its material offerings, it can be hard not to grow fond of the West’s underlying values. 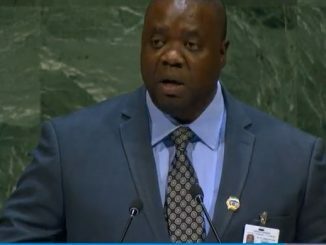 Where are those values when Gambia needs them? But it’s not all doom and gloom when it comes to Jammeh. You can say whatever you want about him, but his “patriotism” even at the price of alleged elimination of his opponents, has never been questioned by his admirers. Some may want to point to some concrete development projects he undertook during his iron grip on this tiny peninsular. He transformed the Yundum Airport from a mere border outpost to an International Airport that Gambians could be proud of. In the communication and transport spheres, he modernized road networks and improved Radio Gambia and television. The educational system was in dire straits before he took over. Gambians went to neighbouring countries like Sierra Leone, Ghana and Nigeria to pursue higher education in the past. Jammeh introduced home based University education as one of his first priorities; which many had dismissed as a pipe dream at the time. He ensured that schools at both primary and secondary levels were widely accessible to all; with free education to all Gambian school age girls. I remember my time in the Gambia, when children had to walk for miles to the nearest school. Above all, he promoted farming as one of the mainstays of his country’s economy; albeit with relatively minimal success. These are some of the attributes his supporters would like us to take into cognizance. With that said the hope is that Jammeh would see reason and save his country from anarchy. Instead of giving refuge to Jammeh and his family, America needs to wring some diplomatic fingers for him to honour the voice of the ballot box. Jammeh is not short of accolades and titles. 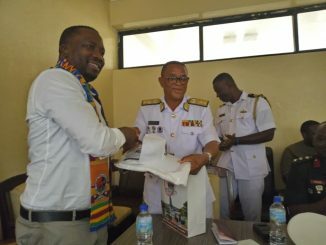 In 2015, he added the title “Babili Mansa” – a Mandinka-language honorific which can be translated as “chief bridge builder” or “conqueror of rivers”. There can be no better time to be that bridge builder; as Gambia finds itself at political crossroads. Jammeh can peacefully handover power and leave posterity to be the judge of his rule in the Gambia. I honestly believe that Yahya Jammeh loves his country. There can be no better way to show your love for your country than saving it from the jaws of disaster. Your legacy will be woven into the fabric of The Gambia, no matter what. You don’t complete a journey and then go back to look for the beginning. No man rules forever on the throne of time; because an army of sheep led by a lion can defeat an army of lions led by a sheep. Remember that “when dictatorship is a fact, revolution becomes a right. We pray and hope that Gambia takes the path of an evolution, rather than a revolution. Only one man can ensure that: YAHYA JAMMEH. 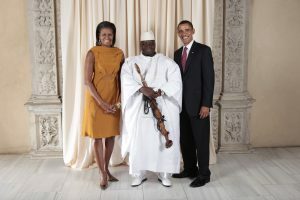 America, Europe and ECOWAS; you owe it to the peace loving Gambians, to democracy and to posterity. Wishing a Happy New Year to a New Gambia.